← Argan oil is the summer best treatment for common skin ailments. Can a Social Enterprise Thrive? An analysis of the data generated by the Kauffman Foundation’s Firm Survey (one of the longest and largest studies ever of privately owned startups) shows that KENZA International Beauty has several of the key factors for thriving over the next three years (we just had our second anniversary in September). However, as shown by the study, having a higher level of capital would greatly improve the chances for growing into our fifth year. This is where you can help tilt the odds in our favor by voting for us. The CHASE grant would help us bring our business to the next level. It would allow us to introduce new beauty products, invest in marketing, upgrade and optimize our website, develop our wholesale business, and perhaps even hire staff. In the end, the grant would help us generate more sales and, consequently, our support for women. The INC. magazine charts summarize the effect of various factors (gender, age, race, amount of startup capital, and intellectual property) on company outcomes: survival, closure, or merge/acquisition after five years. -Companies with the highest level of startup capital (more than $100,000) had the highest chance for survival (about 64%). I AM a Mom, CEO, a Moroccan in New York City on a mission to make BEAUTY a GENEROUS act. 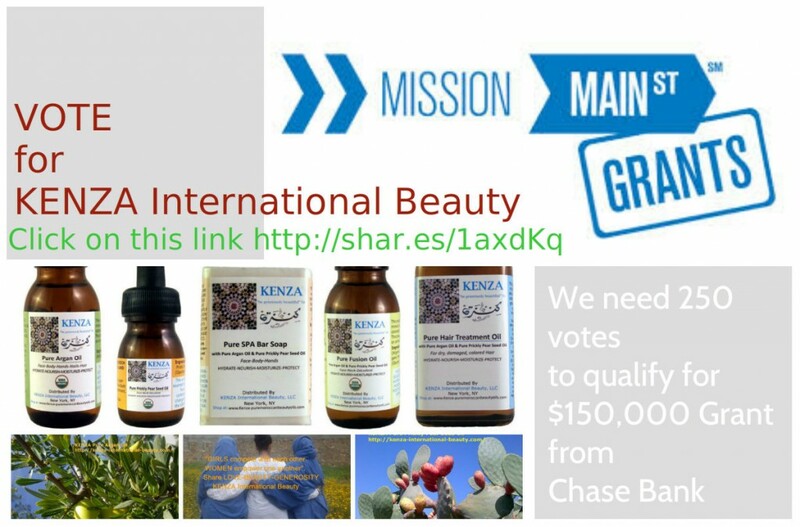 This entry was posted in Pure Moroccan Beauty Oils and tagged beauty, business, chase, chase small business, KENZA International Beauty, mission main street grant, MOROCCAN OILS, philanthropy. generosity, small business, social enterprise, vote. Bookmark the permalink. 1 Response to Can a Social Enterprise Thrive?